"Google Analytics Connector For Informatica Powercenter"
The Power Exchange Informatica Connector for Google Analytics is designed to integrate Google Analytics sources within Informatica PowerCenter installations. 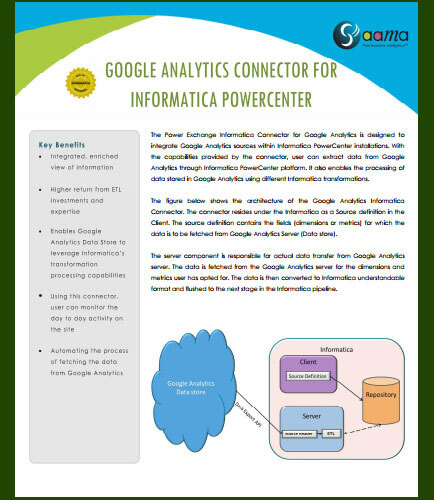 With the capabilities provided by the connector, user can extract data from Google Analytics through Informatica PowerCenter platform. It also enables the processing of data stored in Google Analytics using different Informatica transformations. Google Analytics Informatica Connector resides under the Informatica as a Source definition in the Client. The source definition contains the fields (dimensions or metrics) for which the data is to be fetched from Google Analytics Server (Data store). The server component is responsible for actual data transfer from Google Analytics server. The data is fetched from the Google Analytics server for the dimensions and metrics user has opted for. The data is then converted to Informatica understandable format and flushed to the next stage in the Informatica pipeline.